In a situation as generally germy as a bathroom, why have people touching more things than they need to and spreading microbes everywhere? 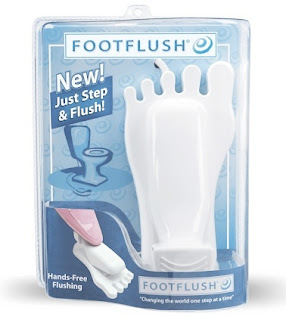 That's the idea behind the freakishly anatomical but otherwise quite useful Foot Flush, a retrofit which allows your toilet to be flushed with a step on the pedal. It's a great idea, I just think it needs to be extended to more of the bathroom routine - so let's get the previously-posted foot-controlled faucets in there as well, and how about a pedal that controls the toilet seat, lifting it like a trashcan lid only when it's stepped on? Heck, hands could practically become obsolete!